Grab a feed at Outback Steakhouse, mate! Outback Steakhouse – Glorietta has always been our regular “go to” place after our usual shift when I was still with Ascott. Even now that I am no longer connected with them, me and my former colleagues still do our “Friday Night” get-together sessions here because of the enormous portions of food they serve, spacious seating with smoking (ground floor) and non-smoking (2nd floor) areas, plus a really nice staff! It is also situated strategically – near 2 big malls, 2 hotels, a cab lane and a few strides away from the MRT. Very accessible. 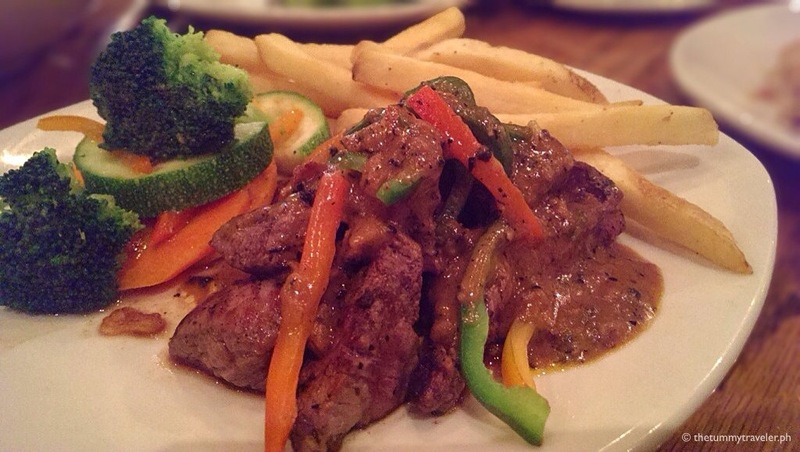 With Outback, you are assured of new and tasty dishes every now and then. And now, you can enjoy affordable, satisfying Outback offerings served in just the right portion during their Weekday Lunch Specials with items that start at Php199.00 from 11AM to 3PM. You may also add a cup of their Soup of the Day and a glass of Iced Tea/Soda for Php95.00 only! Your choice of seasonal featured fresh fruit: green or ripe mango, lychee, apple, banana. I had dalandan that night. Although made from concentrate, it tasted great and refreshing. This complimentary bread has always been my favorite. I love spreading a generous amount of their whipped butter in every slice. 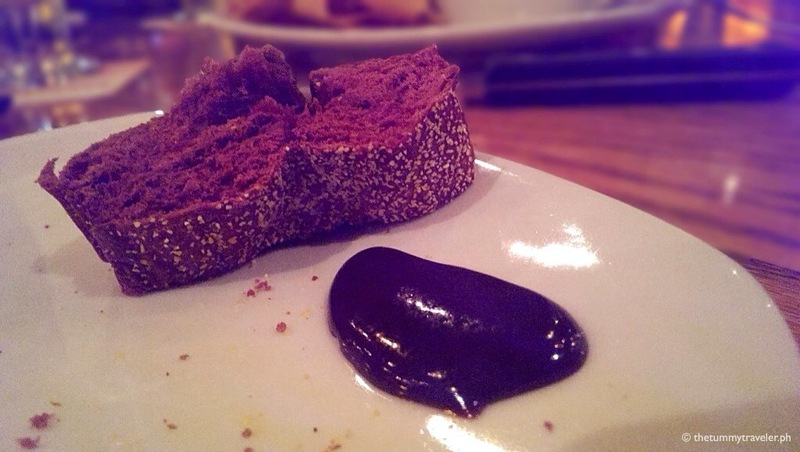 It compliments the bread’s faint coffee taste. We also tried spreading some melted chocolate and it’s pleasantly delicious, too! These steak bites have been smothered with pepper. I liked it because I love my steak covered with this amazing spice! You have to eat it with fries if you are not much a pepper fan. 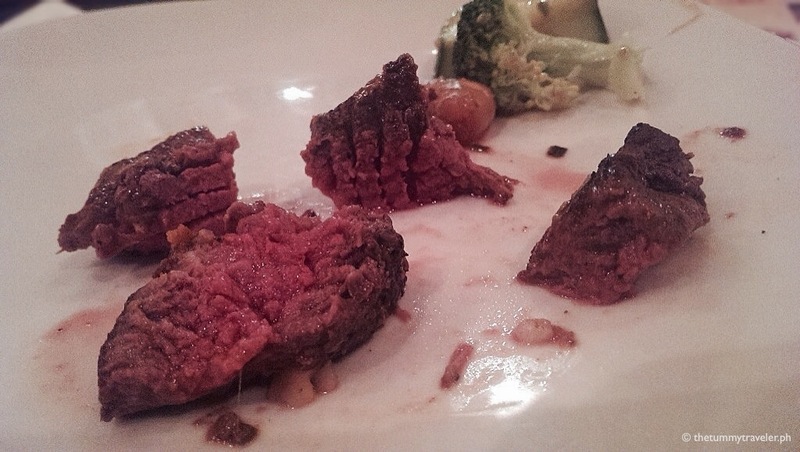 The doneness of the steak that was served to us was medium well leaving it juicy and tender. Tender beef cubes skewered in-between onions, red and green peppers. Grilling the onions and peppers give out it’s sweetness and cuts off the bite giving it a great flavor. 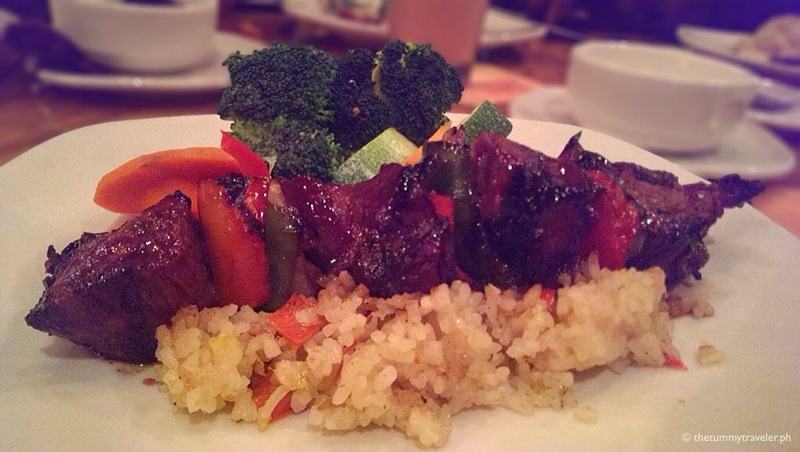 Served over a bed of seasoned rice with your choice of one side dish. Baked with Outback’s tomato marinara topped with buttery, garlic breadcrumbs. 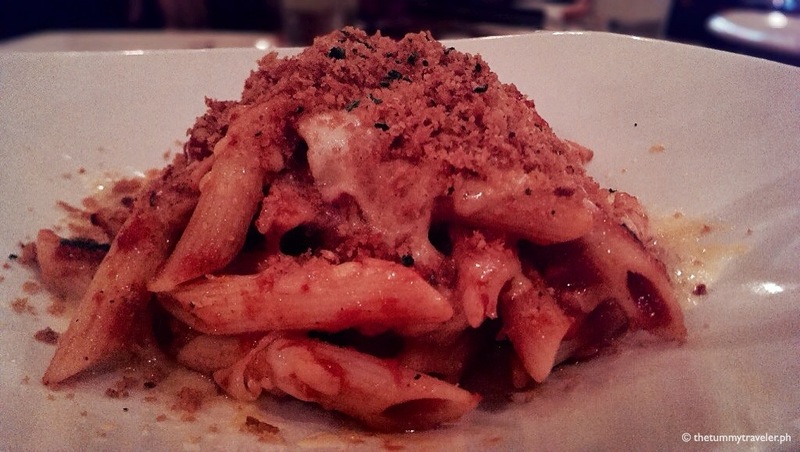 I like how the sauce seeps through the al dente penne pasta while the crunchy topping gives it a little rough texture. Easy to eat and kids will love it! If you want something more healthy, then this dish is for you. 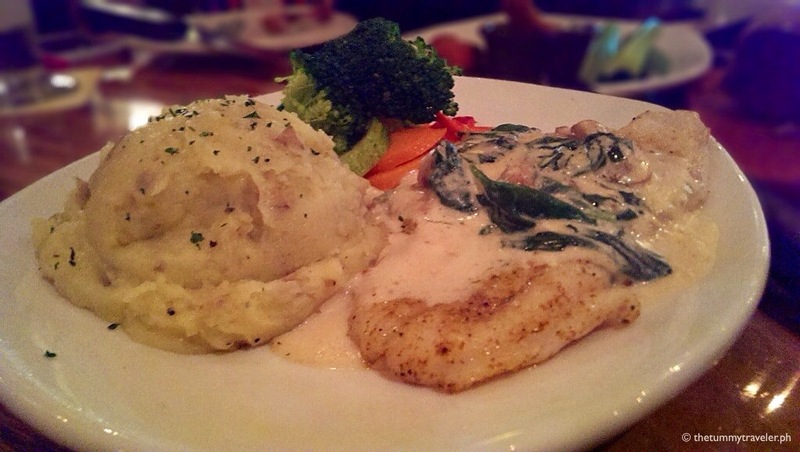 The Grilled Fish Marsala uses fresh fillet with Outback’s spinach and mushroom marsala sauce. Best paired with mashed potato. This was wiped out in seconds leaving these cut up pieces on my plate. This picture doesn’t do justice as to how amazingly juicy this fillet is! You’ll immediately see the juice when you cut into it! This.is.the.bomb! Starting this month (November), they are also serving these wonderful items which will only last for a quarter. It’s what they call a “Limited Time Offer”. So, get ’em now! 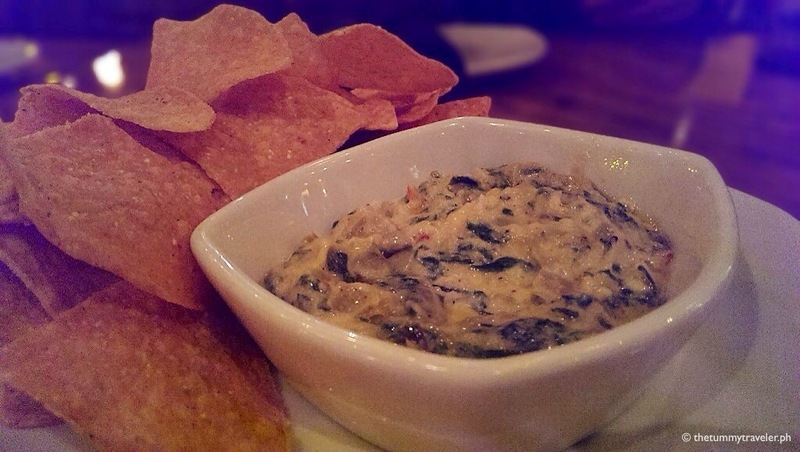 This baked dip with a creamy blend of spinach, artichoke, Monterey Jack and Parmesan cheese was a sure hit! A great appetizer to start a meal. 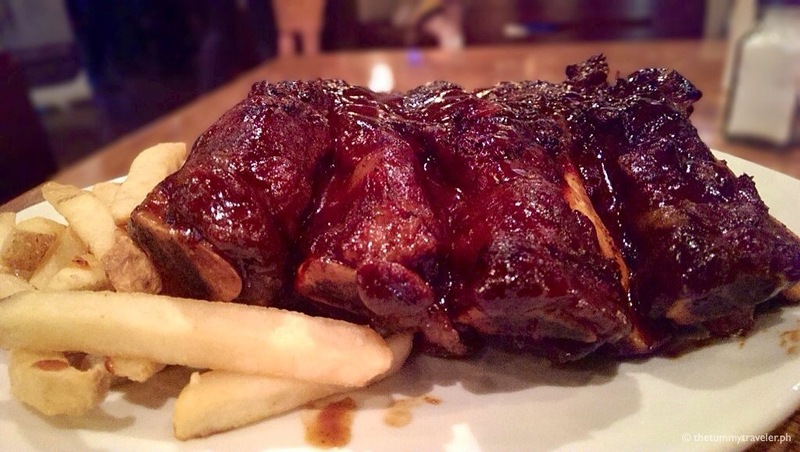 Perfectly grilled and well seasoned ribs with a sweet and tangy sauce that falls off the bone! I don’t think you’ll be able to say no to this sinful Cinnamon Oblivion (Php319.00) even if you don’t have a sweet tooth! How. Can. I. Say. No. To. Vanilla. Ice. Cream. And. Caramel? My two favorite desserts! 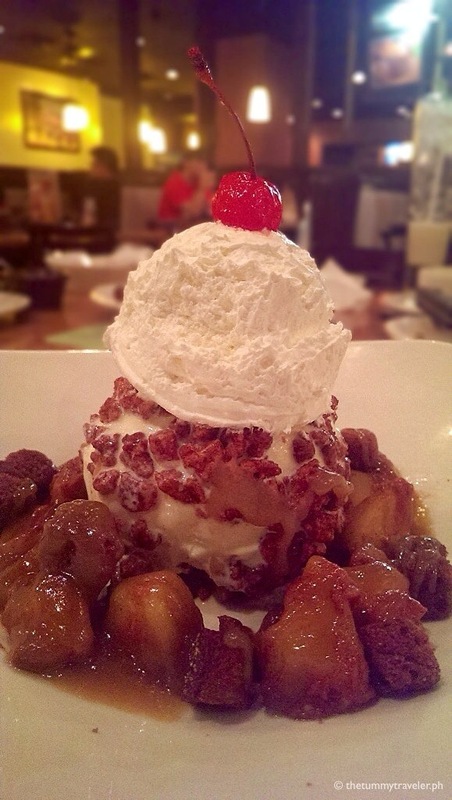 The fresh warm cinnamon apples + cinammon croutons + pecans + caramel sauce + whipped cream are to die for! The pecans give it a deliciously different twist. It was like having a piece of heaven on my plate! While we tried their mouthwatering new offerings, we were also treated to some of their classic dishes. 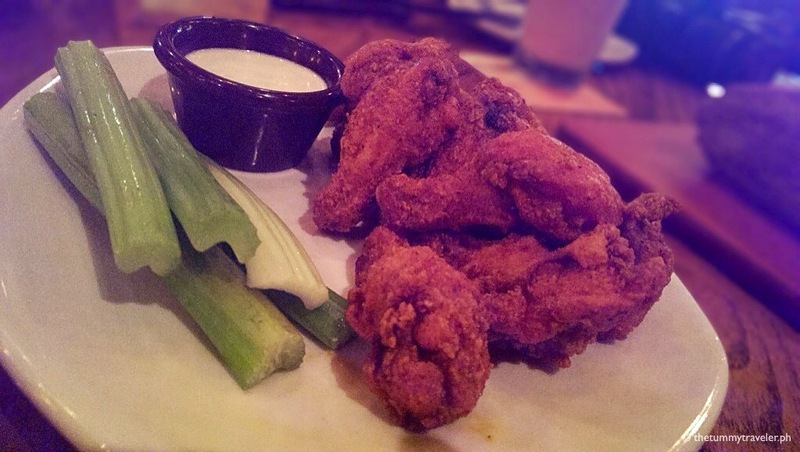 The last batch they dished out were really hot but I handled it… with a lot of Bleu Cheese dressing. The spiciness can be adjusted to your liking though – from mild, medium to hot. 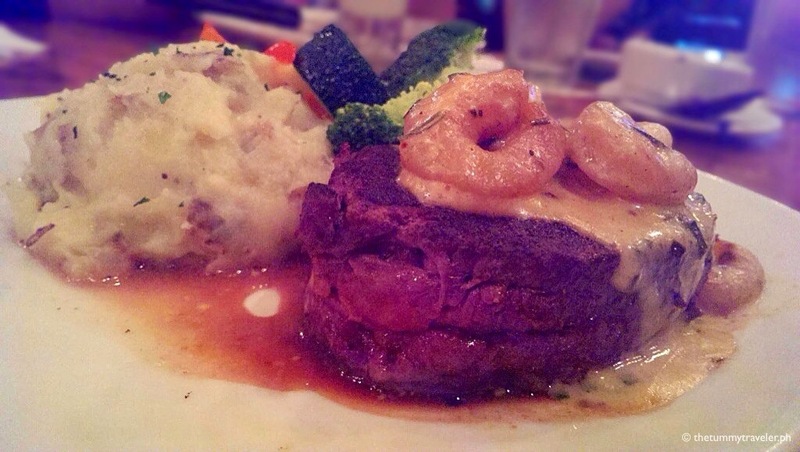 I am not used to eating my steak with a shrimp on top so, I ate it separately and it was really quite good! This 6-oz. fillet was seared perfectly with tomato cream sauce poured over it and served with mashed potatoes and fresh seasonal veggies. You’ll never go wrong with steak and potatoes! Those who follow me on social media and on my blog know that I’m no chocolate lover. I don’t go ga-ga over it. I tried a small serving and yes, it was delicious and sinfully calorie-loaded. Made of fresh-baked pecan brownie with vanilla ice cream, drizzled with warm chocolate sauce, chocolate shavings and whipped cream. 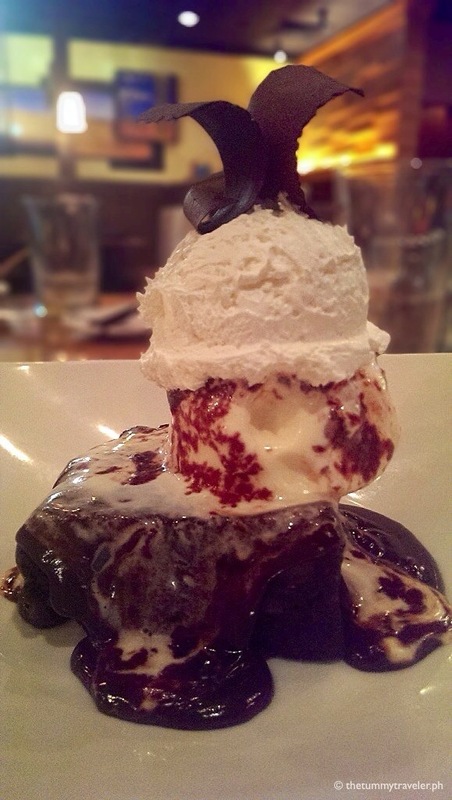 Definitely a chocolate lover’s dream. 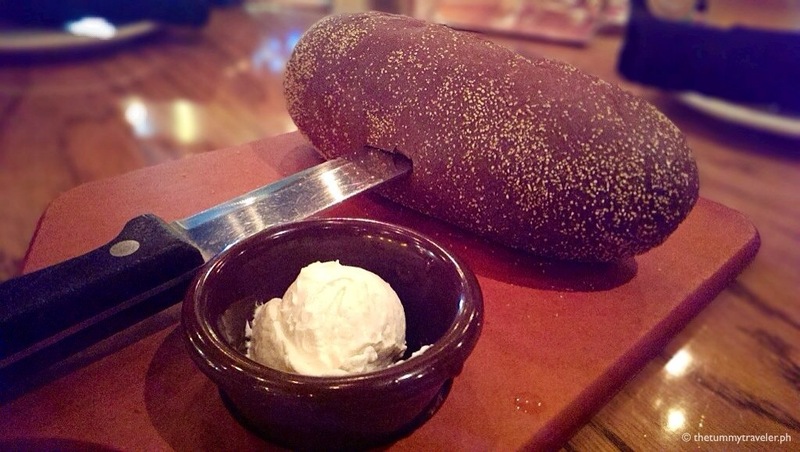 Outback’s signature dishes are so good that people come back for it again and again. No wonder, Outback has stood the test of time. 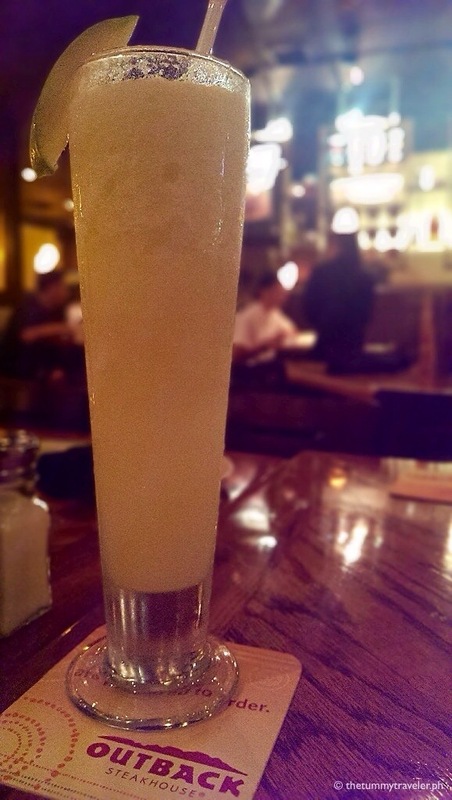 You are Here >> Home » Food » Grab a feed at Outback Steakhouse, mate!